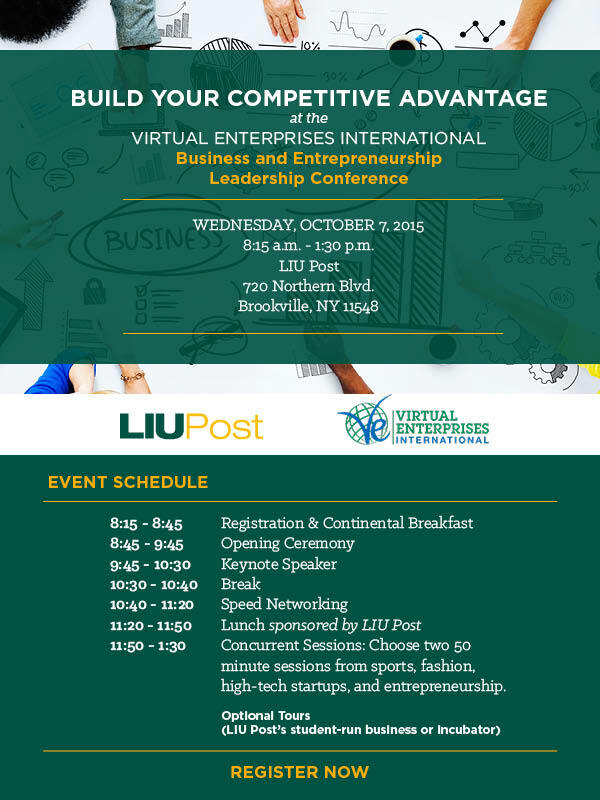 VEI is excited to announce that we will be partnering once again with LIU Post to provide VEI students with an extraordinary opportunity to attend the VEI Business and Entrepreneurship Leadership Conference on October 7. Open to all New York City and Long Island VEI students, this can’t-miss event will enable students to network with and hear from industry experts and successful entrepreneurs, participate in informative and exciting breakout sessions, and deliver an elevator-pitch, which will be judged by business professionals. Sessions include Sports, Fashion, Branding, and Entrepreneurship and will be led by accomplished leaders from these sectors. Teachers must register interested students within the Portal. Read more about last year’s event here.